This documentation and accompanying sample application will get you started building a complete application that targets Windows Phone OS 7.1. You will learn the basics of Silverlight and Windows Phone development by creating a simple fuel-tracking application for your car. This documentation and accompanying sample application are best suited for developers with the following experience levels. To watch videos about the basics of Windows Phone development, see the Windows Phone Mango Jump Start series and the Windows Phone 7 Development for Absolute Beginners series. The Silverlight framework supports event-driven, XAML-based application development. The XNA Framework supports loop-based games. Silverlight and XNA can also be combined in a single application. The following table lists some of the criteria that you can use to determine whether you should use Silverlight or the XNA Framework for your Windows Phone application. With Windows Phone OS 7.1, you can combine Silverlight and XNA into one application. For more information about Silverlight and XNA, see The Silverlight and XNA Frameworks for Windows Phone. For more information about the application platform, see Application Platform Overview for Windows Phone. This documentation describes how to develop your application using Silverlight for Windows Phone OS 7.1. The companion Fuel Tracker application for this documentation was originally written in Silverlight for Windows Phone OS 7.0 and has been upgraded for Windows Phone OS 7.1. For information about the changes made, see Upgrading Your Application from Windows Phone OS 7.0 to 7.1. As a developer, you submit your applications to the Windows Phone Marketplace through the App Hub website at http://create.msdn.com. App Hub provides a variety of resources for Windows Phone and Xbox 360 development. To learn more, see the App Hub Getting Started Guide. To submit applications, you must purchase an App Hub subscription, which costs $99 USD per year. You can submit up to 100 free applications and unlimited paid applications. You must have an App Hub membership before you can deploy and test your applications on a physical Windows Phone device. To learn more or to sign up, see the App Hub Membership page. WVGA (800 x 480) format display. Sensors for A-GPS and accelerometer. Start, Search, and Back buttons. 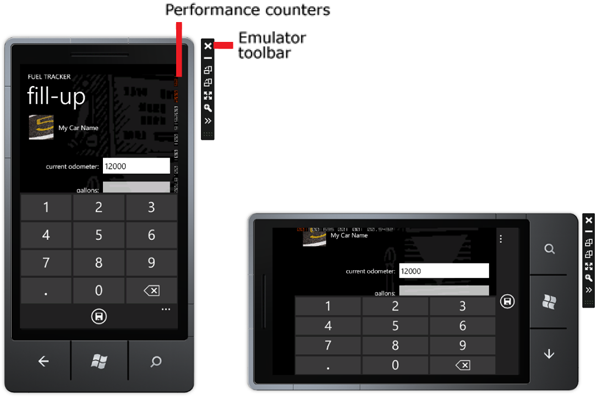 For more information, see Hardware Specifications for Windows Phone. When you write applications for Windows Phone, you should be familiar with some of the terminology. The following illustration shows some of the elements of a Windows Phone. 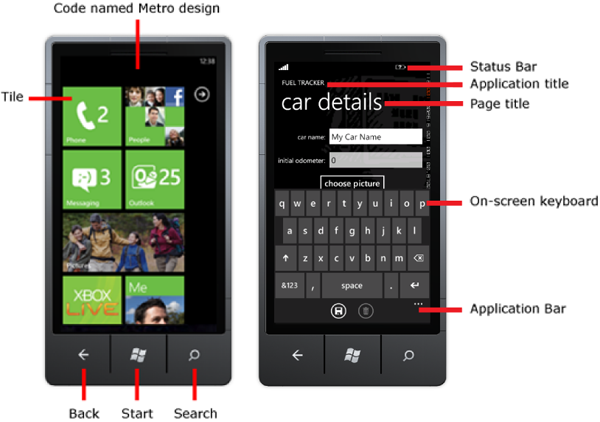 New Windows user interface (UI): The user interface (UI) used in Windows Phone. You should follow this design in your applications so that they integrate with the operating system and other applications. The design provides a modern UI that is easy to use. For more information, see Design Resources for Windows Phone. Tile: A representation of an application that appears in the start screen. A tile can be designed to be dynamic and display information to the user. Status Bar: Indicates status of phone operations, such as signal strength. Not necessarily application specific. Application title: The title for the application, which is typically in all caps. Page title: An optional title for a page that does not scroll. Page titles are typically in lowercase. On-screen keyboard: The keyboard that appears when the user edits a text field. Also known as the soft input panel (SIP). Application Bar: Optional application-centric navigation bar that contains buttons and/or menu items. Hardware Buttons (Back, Start, Search): Buttons required to be present on every Windows Phone. These buttons enable the user to back up, return to the start experience, or search the current context. When you install the Windows Phone SDK, you get the following free tools and components. If you already have Visual Studio 2010 (Professional, Premium or Ultimate) installed, then you can use Visual Studio 2010 for development after installing the Windows Phone SDK. Expression Blend for Windows Phone is a design suite that allows you to create and add special visual features, such as gradients, animations, and transitions. For some tasks, Expression Blend is easier to use than Visual Studio. The following list contains some of the tasks that are easily accomplished with Expression Blend. The following illustration shows an example of Expression Blend. This documentation targets Visual Studio 2010 Express for Windows Phone and does not use Expression Blend for Windows Phone. For more information about Expression Blend, see Microsoft Expression and .toolbox. Visual Studio 2010 Express for Windows Phone includes a drag-and-drop designer that emulates the appearance of the phone, a code editor, and a debugger. If you have worked with Visual Studio for developing other kinds of applications, you will find the environment to be very similar for phone applications. 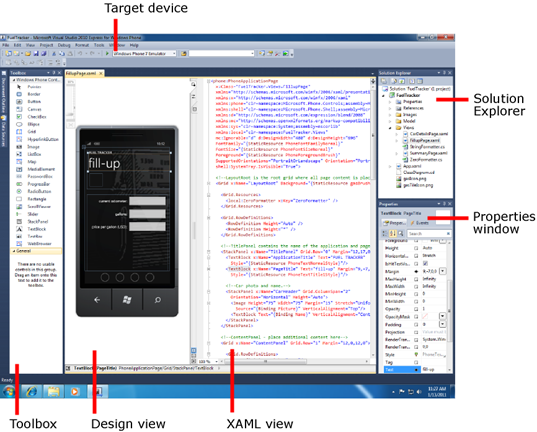 The following illustration shows the Visual Studio 2010 Express environment for the phone. The designer for Windows Phone contains the Toolbox, Design view, XAML view, Solution Explorer, and the Properties window similar to the Visual Studio designer. Two key differences are that the design surface looks like a Windows Phone, and the addition of the Target device, which enables you to choose whether you debug your application on a device or the emulator. The following illustration shows an example of the emulator in portrait and landscape orientations. For information about using Visual Studio to develop phone applications, see Visual Studio 2010 Express for Windows Phone and Windows Phone Emulator. For information about the Visual Studio designer for Silverlight, see Silverlight Designer for Visual Studio 2010 Overview. It is important that you are aware of the established design guidelines if you plan to publish your Windows Phone application in the App Hub. The design guidelines describe how to design the UI for your applications. Design guidelines, certification requirements, and other important information will be repeated in this documentation where they are relevant. The following table is a summary of the key design guidelines and application requirements that you should consider as you design and develop your application. For the complete and most up-to-date design guidelines, you should visit the following link. Use the Application Bar for common application tasks. If the action is difficult to clearly convey with an icon, place it in the Application Bar menu instead of creating it as a button. Limit Application Bar menu items to five in order to prevent scrolling. The Back button automatically goes back or exits the application. You should not override except in the case of data loss. The Back button can be used to close on-screen keyboard, menus, or dialogs. Portrait is the default application view. To support landscape view, you must add code. If your application supports text input, you should support landscape orientation because of the possibility of a hardware keyboard. If the foreground or background color of a control is explicitly set, verify that the content is visible in both dark and light themes. If the specified color is not visible, also explicitly set the background or foreground color to maintain contrast; otherwise, choose a more appropriate color. Supply a Cancel button for actions that overwrite or delete data or are irreversible. When using additional screens with Commit and Cancel buttons, clicking those buttons should cause the associated action to be performed and return the user to the main settings screen. You should set the input scope property for a text box or other edit controls to define the keyboard type and enable the appropriate typing aids. The Canvas control uses a pixel-based layout and can provide better layout performance than the Grid control for deeply embedded or nested controls in applications that do not change orientations. The Grid control is the best choice when the application frame needs to grow, shrink, or rotate. Vertical scrolling through a list or grid in Panorama sections is acceptable as long as it is within the confines of the section and is not in parallel with a horizontal scroll. You should not use Application Bar buttons to provide navigation in a Pivot control. If the Pivot requires navigation aids, you are probably misusing it. You should primarily use the Segoe font. Use alternative fonts sparingly. Avoid using font sizes that are smaller than 15 points. The application title in the title bar should be all capitals. Use all lower case letters for most other application text including page titles and list titles. In the Application Bar, any text you include is automatically displayed in all lowercase. The following are some links to additional resources external to this documentation where you can learn more about Windows Phone development. Additional documentation, code samples, and a community for Windows Phone development. Official Windows Phone development documentation on MSDN. Official Silverlight and Silverlight for Windows Phone documentation on MSDN. Downloadable code samples that supplement the Windows Phone documentation. A collection of short topics that demonstrate tasks or features in Windows Phone development. A developer guide that describes a scenario around a fictitious company that has decided to use Windows Phone 7 as a client device for their existing cloud-based application. A blog that contains current information and announcements straight from the Windows Phone team. A video series for absolute beginners that assumes no knowledge of programming or Window Phone development. A video series for developers new to Windows Phone development using Silverlight or XNA. Videos and hands-on labs for Windows Phone development using Silverlight or XNA. 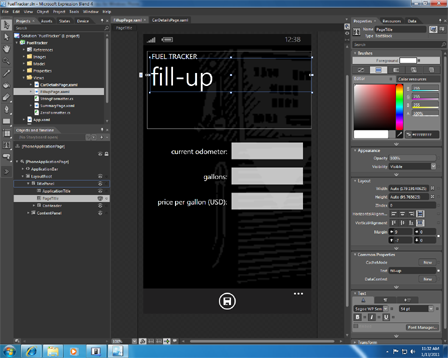 Tutorials and other resources that target designers to learn about how to design Windows Phone applications. Includes tutorials on Expression Blend. A blog about Silverlight, Silverlight Toolkit, and Silverlight for Windows Phone. Jeff Wilcox is a senior software developer at Microsoft on the Silverlight team. A blog about various areas in .NET programming, including Silverlight and Windows Phone. Jeff Prosise is long-time Windows programmer and a cofounder of Wintellect.